Born in Franklin Tennessee in 1987, Emi Secrest was already singing at the tender age of three. By the time she was five, she was singing publicly. Her life’s path had begun. Immersed in several styles of music, Emi performed in musicals with various choirs and sang with her own band in legendary Memphis clubs. She received a music scholarship to the University of Memphis and continued performing live throughout the Midwest and Southern Regions of the United States. In 2009, Emi made the leap into professional music by moving to Los Angeles, where she quickly began performing with a wide range of artists, including Steve Tyrell, Leona Lewis, Anthony Hamilton, and Macy Gray. Ready for the solo spotlight, this amazingly powerful singer/songwriter released her EP, Fearless, in 2014, a single, Rollercoaster, in 2016, that came she says, ‘…with love, strength, and pain, digging deep into a heart shaped paradox…’ and her powerful new album Blue. Emi can also be heard singing the theme song for the hit daytime talk show The Real. 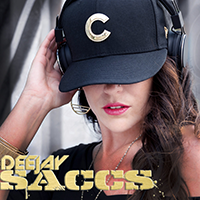 DEEJAY SACCS began her career classically trained and composing on the piano, guitar and drums at a very young age, so she’s no stranger to the world of music! DJing has led her to a love of blending in most any genre that keeps the party flowing. Her collection of songs and mashups travel wide. Hip-Hop, Electro, Breaks, Reggae, Pop & Rock, you name it she can mix it! SACCS has taken the stage at some of the most well-known venues and events in her hometown of Chicago including Chicago Fashion Week, Metro Chicago, House of Blues and many more. DJing for a good cause is also close to her heart. She’s spun for a number of special organizations including Habitat for Humanity, Live4Lali, The Susan G. Komen Breast Cancer Foundation, Heartland Alliance and NAMI. 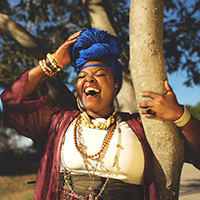 She’s extremely excited to bring her Chicago club sounds to the stage at Simply diVine for the listening delight of Los Angeles LGBT Center’s friends and guests.